Living Stone Faith: Happy SITS Day! Today is my SITS Day. SITS is a wonderful online community of bloggers who support one another by visiting and commenting on one another's blogs. Each day the SITS site hosts a featured blogger. Today is my day. I hope that you take the time to peruse and review the posts on my blog. Relax and stay a while. Enjoy your time while you are here. There are all kinds of posts from humorous to serious. Lighthearted and heavy hearted. Thoughtful and close to tearful. I write whatever happens to cross my mind on any given day. So, join me on my SITS Day. I hope you enjoy your time here. Oh good heavens... 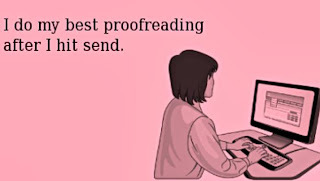 I also do my best proof reading after I hit send!!! Hi Vicki, I had a lot of fun looking at your book page. You are a prolific writer! So nice to meet you from SITS. Currently I am looking up the definition of soul/sole. I proofed and proofed and thought I had it correct, but it doesn't look right this morning...or maybe I mean it doesn't look write! I always find typos no matter how well I think I edit. Hi Vicki! Happy SITS Day, and you are an inspiration to others for your fight against depression and writing. I am happy to see the ECT treatments are working and you are only suffering headaches as a side effect. Will send prayers from here that those depressive episodes will be a thing of your past and you have nothing but a bright sunshine-y future for you and your family. Happy SITS Day, Vicki! Enjoy! Big congrats on your SITS Day! Hope it's a lot of fun! Just read your previous post... Hope treatment continues to do well. I also proofread after hitting the send button. Thanks for the laugh. Visiting from SITS. Happy SITS Day! What grace and charm you have! Love your stuff! Happy Sits Day! Enjoy the limelight today! I like your five minute Friday posts! A great idea. Hope your treatments continue to be successful and you'll soon be well. Hope you are enjoying your SITS Day today. I love your Blog, and your books look amazing. 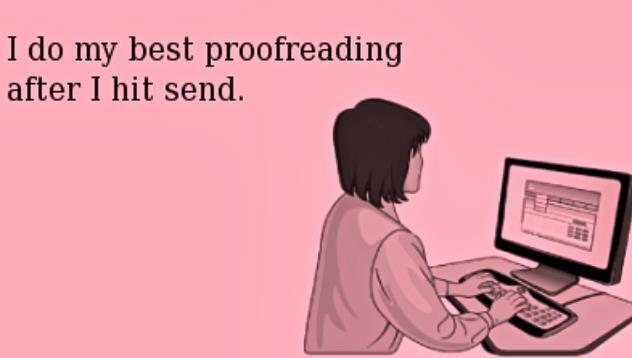 I love the image about proofreading after hitting send, that sounds like me too! Happy SITS Day! I love that ecard! It's amazing that no matter how many times I proofread something, I only see the mistake after I submit it! Have a wonderful day! I can so relate to that e-card...I can't tell you how many times I have fixed something after I hit send! Congrats on your SITS day! I am going to go visit the rest of your blog! Thank you to everyone who commented. Thanks for visiting my blog. I'm having a great SITS day! Hi Vicki! Congrats on your feature day! Enjoy! What a lovely introduction; about SITS and your special day as a Featured Blogger! Love the pic of you and your pooch! Happy SITS Day, Vicki! I love the e-card. It describes me to a 'T'! I think we can all relate to that eCard. It's the worst, isn't it? That card is SO funny and SO true! Happy SITS day to you! That graphic was everything Vicki! I don't know what it is but it always happens. Enjoy today! Happy SITS Day!! Off to look around some more! Happy SITS Day! The ecard is perfect!!! Happy SITS Day Vicky! So nice to meet you! Hi Vicky, hope you are having a good feature day! Glad I found your blog. I hope you have a wonderful SITS Day! Enjoy your feature. Happy SITS Day Vicki...hope you enjoyed it! The ecard WAS funny and oh so true! May you have a blessed week! Oh no - it looks like I'm a day late! A Happy Belated SITS Day. I'll be stopping in for the next post.